• Polished 18K yellow gold case with the Breguet signature coined edge. • Main dial with a very fine concentric criss-cross guilloche texture. • Time sub-dial with a unique cross-weave basket pattern. • Small seconds sub-dial with linear sunburst texture. 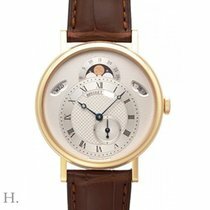 • Time indicated by an off-centered dial with painted Roman Numeral hour-markers chapter ring. • Small off-centered seconds sub-dial at the 5 o'clock position. • Day of the week window displayed at the op left side of the dial. • Moonphase centered at the top of the dial. • Day of the month window displayed at the top right side of the dial. • Breguet Caliber 502.3 QSE1, contains 35 jewels & has an approximate Power Reserve of 45 hours.